The recession has been difficult on the interior design trade and many of our fellow designers no longer have showrooms or access to wholesale accounts. Bridgette Boylan Interiors welcomes the interior design trade to utilize our resources and facilities for their client needs. We have established accounts with over 100 vendors and offer highly competitive pricing on furniture, fabrics, accessories, and more. 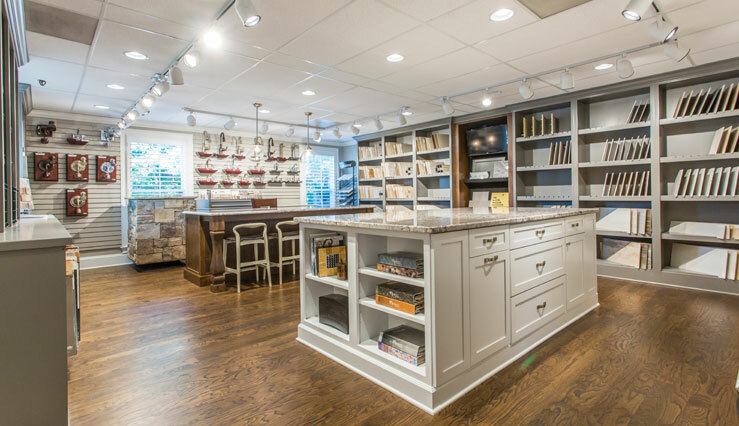 Our extensive resource library can help you in selecting many materials for your clients, including tile, granite/quartz countertops, flooring, furniture, fabrics and much more. You may schedule a work session to review fabrics and furniture catalogs or reserve one of our Design Studios for a private client meeting. A Trade Account requires a copy of your business license and sales tax certificate to be on file with BBI. For further information, email Erica McCrory or call 770.447.5800. "For quite some time now, maybe 10 years, I have worked with Bridgette and her Fabulous team at Bridgette Boylan Interiors. I have brought in my own clientele to her well-equipped and appointed studio to make finish selections for new construction as well as remodel projects. The ease of having Bridgette Boylan Interiors as a trade source is invaluable and I will continue to have BBI as one of my top industry resources with everything I need for either type of project right there in their free-standing designer studio. I would recommend Bridgette Boylan Interiors to any homeowner, Builder or designer as being extremely thorough, reliable, and an honest company to do business with. Over the Top, I say!!!" "As an interior designer in the Atlanta area, I've been purchasing furniture, carpet, fabric and accessories from Bridgette Boylan Interiors for the past 4 years. She offers a wonderful selection of the most current styles at an outstanding price. Her showroom is beautiful and so conveniently located as most of my clients live in Roswell, Alpharetta, and Buckhead. It's been such a pleasure working with her and her staff." ""Bridgette, I wanted to take a moment to thank you for all the great service I received from you and your staff during the past year. I really appreciate the extra effort and timely responses with my quotes and order entries. You have definitely made an impact on my business. Thank you!" "